It’s not easy being the Nashville Predators. Still a relatively new franchise in the NHL, it’s nestled geographically near two Original Six teams that have far-reaching fan bases: the Detroit Red Wings and the Chicago Blackhawks. Both teams are well represented inside Bridgestone Arena when their teams visit Nashville, as swaths of red cut through the gold sweaters of the Predators faithful. The Preds fought back against the Red Wings’ incursion with a campaign called “Keep The Red Out” that allowed Detroit fans to turn in their jerseys at the Nashville Pro Shop and receive 50 percent off a new Predators sweater. Over 300 Red Wings jerseys were surrendered, according to the team. With the Red Wings off to the Eastern Conference, the Predators are now focused on eliminating Chicago Blackhawks jerseys from their arena this season. 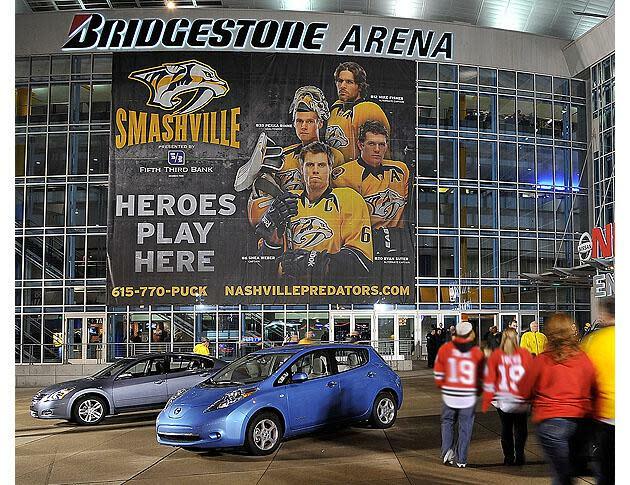 By forcing Chicago fans to spend twice as much to see their team in Nashville. According to Nashville Predators President and Chief Operating Officer Sean Henry, speaking with Section 303, the Preds will not allow single game ticket sales for their three home dates against Central Division rival Chicago on Nov. 16, Dec. 17 and April 12, 2014. If you want tickets to those games, you’ll have to buy tickets to a second non-Blackhawks game too. That helps keep Chicago fans at bay, for sure. But what if Blackhawks fans really want to jump through hoops to see their team play in Music City? “They’re going to have to earn it,” Henry said. “And they’re going to help us continue to grow our roster by building our (revenue at the) gate. It’s that simple. In the end, we’re building something pretty special. If we have to do it off the backs of their fans a little bit, I’m not apologizing for it. And if you’re a Nashville fan bitter than you have to buy two games to get to see the defending Stanley Cup champions? Henry said tells Section 303: “We’ve built in a plan where they can donate the ticket back to members of the military,” he said. In a way, this is no different than variable pricing plans: It’s a way to gouge the invading fans and profit from them. The Buffalo Sabres jack up the prices for their Toronto Maple Leafs games on the assumption that they can’t keep visiting Ontarians out of the building. So, might as well make some coin off them. But just like variable pricing, the home fans take some damage too. Sabres fans pay a premium for rivalry games. Wanna see Jonathan Toews and Patrick Kane in Nashville? You have to buy tickets to another game. Donating those tickets is great and all, but if I have a family of four that can only afford to blow it out for one regular-season game a year … guess it won’t be a key Central Division rivalry game against Chicago. The bigger issue: Will it work? Playing the Ted Leonsis zip code game will shut out a good number of fans from Chicago. But the ones that are in “friendly” zip codes can still buy tickets. Would a Blackhawks fan buy two games and then just sell the other game to Predators fans at face or above via StubHub or something? Yeah, probably. But if they are shut out, does it help the local hotels and restaurants that won’t have out-of-towners sleeping and eating in their establishments during Blackhawks’ visits? No, not really. Yet there’s something great about a burgeoning hockey town sticking it to the Original Sixers that attend their home games as visiting fans. This ticket plan, in many ways, reinforces the us-against-them attitude that Smashville is built on. But make no mistake: It’s just a ticket plan, and a way for the Predators to guarantee revenue for additional games on the back of the most popular team left in their division. Maybe it won’t be the guy in the Hossa jersey from Joliet buying these tickets, but someone will – and regardless if you’re a Blackhawks or Predators fan, you’re paying double the price for the chance to see Chicago visit Nashville. Unless, of course, you're a season-ticket holder. Which is ultimately the goal here, we imagine.